The Sketch Bug has bitten me again, along with a desire to try new things. 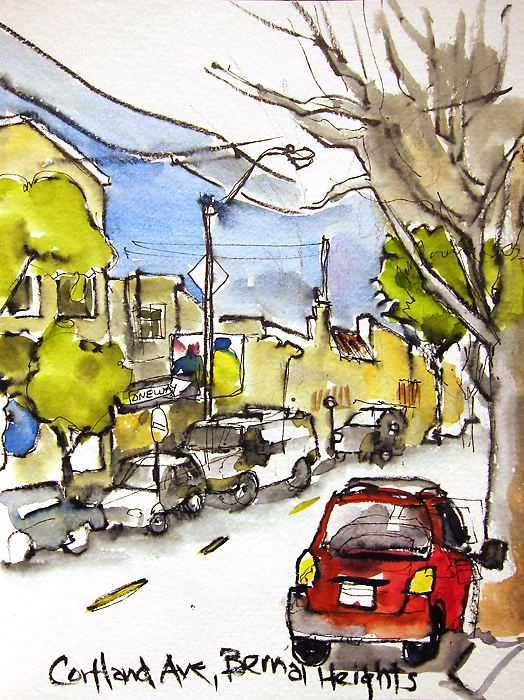 So I jumped at the chance to join the urban sketchers in San Francisco for the 46th Worldwide Sketchcrawl. 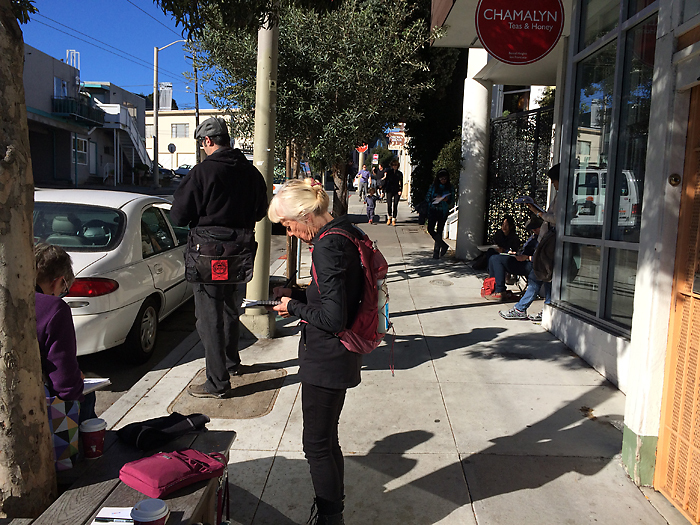 That’s right, all over the world people were sketching together and sharing their work on January 31st. My passion has been sketching people in public places and intimate scenes, but I’ve been wanting to broaden that to include architecture and other city scenes. I live in the country and enjoy the vineyard, mountain and forest vistas each day, but am a bit bored with sketching them. The problem however is that I seem to be allergic to straight lines. 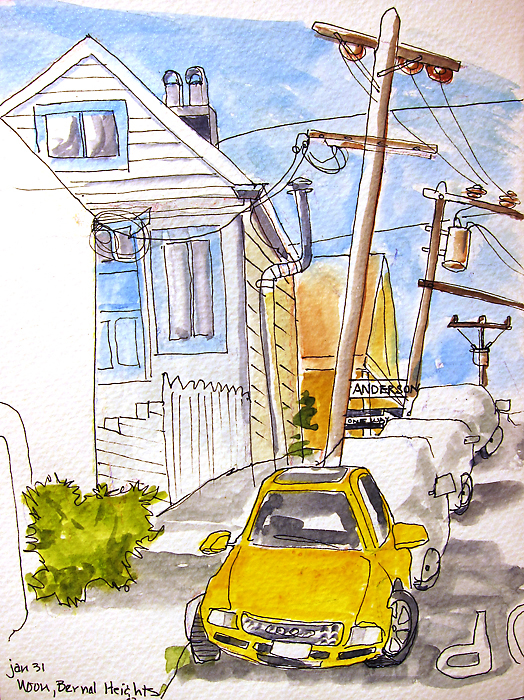 After my day in the city I at least developed an affinity to cars and power lines, and hopefully I’ll learn to manage those beastly angles and perspective too! Bernal Heights was the setting for the meet-up in San Francisco. My friend Carole and I arrived and I was immediately drawn in by the fragrance of the Waffle Shop, wasting precious time to eat my waffle and drink my coffee. Meanwhile the others starting sketching on the street instantly! 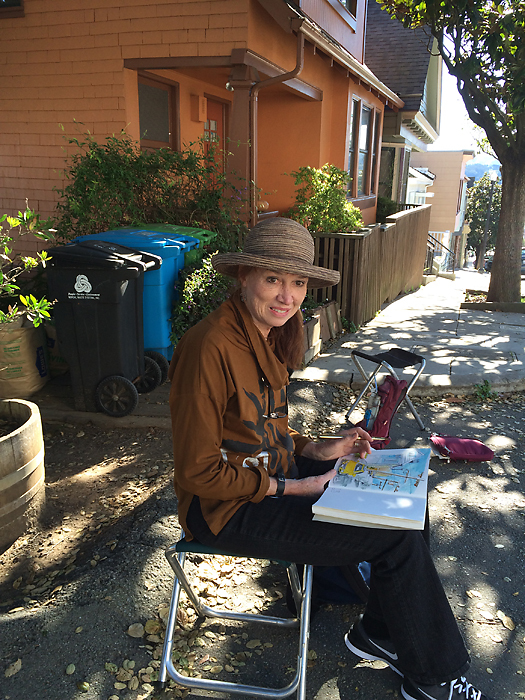 It’s so much easier to do this public sketching with others who are doing it at the same time. Makes it feel as normal as walking your dog or pushing a stroller. Japanese brush pen and w/c in Strathmore journal. 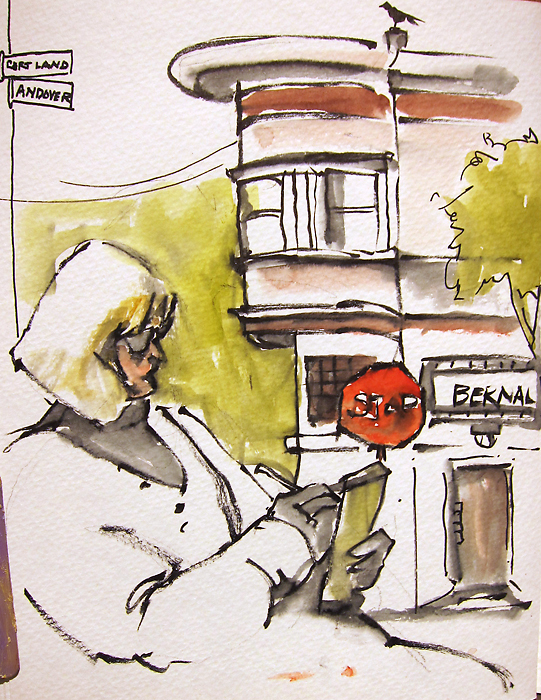 After a long lunch break when we met up with an old sketch friend Jana Bouc, we found a busy spot on the street with traffic, trams, people of all shapes, sizes and preferences (oh how I love this about the city!) and even a Chinese Lion Dance for the children. And we plunged in with our pens and colors. When I found a sketcher and a building with a round edge (hallelujah!) I knew what the next sketch would be. 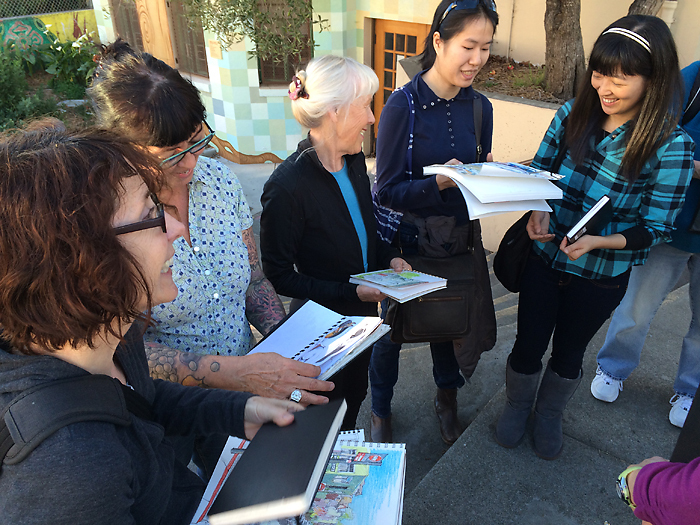 And then, way too quickly, the day was done, and we convened at the library to share our sketches. . .
and to marvel at the different styles and techniques, not to mention the subject matter gleaned in this setting. One sketcher even invited herself into a beauty parlor to do a glorious sketch of a woman under a hair dryer! Am I inspired for more? You bet. That must have been a fun event. As always, I so enjoy seeing your sketches. Don’t you have fun! And, a special artist talent to share. Thanks for the juicy scenes. Enjoyed getting to know you . . . a little.